Hita"- Little Kyoto" SUBPAGE | All Japan Kyoto Association"
Hita basin, surrounded by beautiful mountains, once prospered as the political, cultural, and economic center of the Kyushu area. There were the great activities of wealthy merchants acting as purveyors for the shogunate along with the comings and goings of citizens and artisans. The remains of such a glorious time still remain here and there around the city. From late autumn to early spring, a low ground fog appears and creates a mysterious scene which is described as “the legendary lakeside district appearing from the bottom of the lake.” The fog often appears still today and surrounds the town, people, history, and all of Hita City. 70 min. from Fukuoka I.C. 75 min. from Oita I.C. 90 min. from Kumamoto I.C. In 1601, when Mitsuuji Ogawa, the first feudal lord who ruled Hita, built Maruyama Castle, Mameda Town was developed as a castle town. 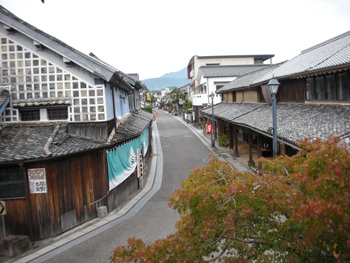 The town became shogunate territories (under direct control of the Edo shogunate) in the early years of the Edo period (17-19th century) and flourished as the center of politics, economics, and culture in Kyushu. On the streets set out neatly in a grid pattern, old houses and museums stand in a row. This precious area deeply retains the atmosphere of the craftsman and merchant town in the modern times. It is designated as the Important Preservation District of Historic Buildings. Access A 15-min. walk from JR Hita Station or a 5-min. drive from Hita I.C. Two of the seasonal traditions of the Hita lakeside district, where the prosperous traces of shogunate territories still remain, are the boat ride and cormorant fishing. Cormorant fishing conducted in Hita City was originally started by retainers of Hideyoshi Toyotomi and they brought cormorant fishermen from Gifu Prefecture. People can enjoy a banquet in the light of bonfires on the river and view the fishermen’s skills as they manage the cormorants on a boat. *Cormorant fishing is held from May 20 to October 31. Access A 15-min. walk from JR Hita Station or a 10-min. drive from Hita I.C. Kangien was a private school opened by Tanso Hirose (1782-1856) who was born in Hita City and was a Confucianist in the late Edo period. By the time the school closed in 1897, about 5000 students had attended from around Japan. 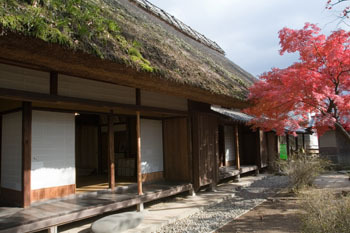 The school was known for its unique teaching methods and produced a number of great figures such as a famous Dutch scholar, Choei Takano, and a tactician, Masujiro Omura. It was designated as a National Historic Site in 1932. Visitors can also stop by at Kangien Educational Research Center and view the materials related to Kangien and Tanso Hirose. It was designated as a Japan Heritage of the Educational Heritage from Early-Modern Japan in April, 2015. Access A 10-min. walk from JR Hita Station or a 5-min. drive from Hita I.C. 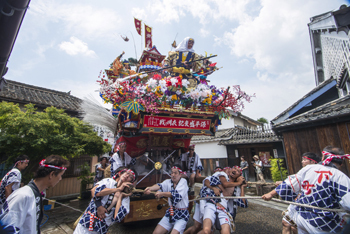 Hita Gion Festival is designated as an Important Intangible Folk Cultural Property of the country. 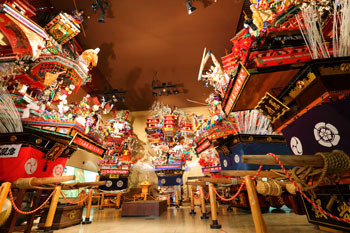 In this hall, six yama and hoko (decorated parade floats), miokuri (woven tapestries), mizuhiki (decorative curtain) and other items related to the festival (held on Saturday and Sunday after July 20) are exhibited. Access A 10-min.walk from JR Hita Station or a 5-min. drive from Hita I.C. 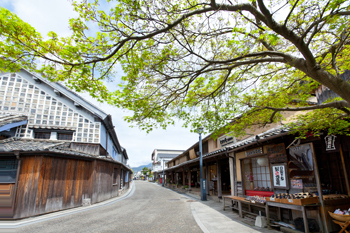 Hita is was highly prosperous and it is said to be the most prosperous town in Kyushu area. It is also known as the birthplace of the Hina Doll Festival. In the old times, merchant remitters or wealthy merchants played an active role in the town’s prosperity and people were wealthy enough to buy gorgeous Hina doll sets from Osaka and Kyoto. Those Hina doll sets are still deeply cherished by every family. 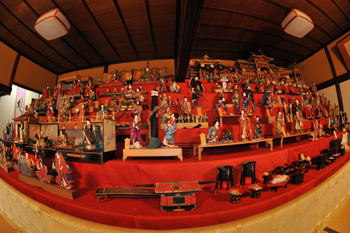 During the festival period, the doll sets are all exhibited in the old residences or museums in the Mameda and Kuma Districts, and more than 100,000 visitors come to enjoy the exhibits. This is the biggest event of Hita held at the same time as the opening of the ayu (sweetfish) fishing season. 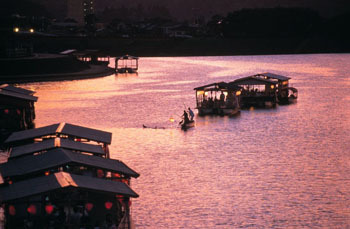 A number of events take place, such as Hangiri Genpei Battle (people compete in a race using a big tub instead of a boat) along with stage shows on the river. 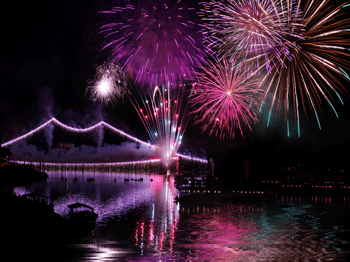 For two days, a total of 10,000 fireworks are set off. The sound of fireworks resonates through the surrounding Hita mountains. Hita Gion Festival is a seasonal tradition of summer in Hita and designated as an Important Intangible Folk Cultural Property of the country. It is truly worth seeing the brave participants wheeling the decorated floats and the beauty of the gorgeous decorated floats at Mameda, Kuma, and Takeda Districts. Only once a year, all nine decorative floats coming together creates such an energetic and festive view. The tune of “Gion-bayashi” music adds a festive atmosphere to the celebrations. Hita Tenryo Festival is conducted with a parade that recreates the prosperous times when the town was the shogunate territory. 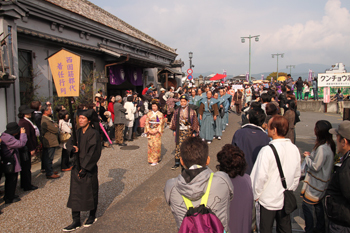 The parade goes through Mameda Town, which retains a quaint and traditional street atmosphere. At the same time, the Sennen Akari Lantern Festival is held with about 30,000 bamboo lanterns that create a fantastic ambience throughout the town. 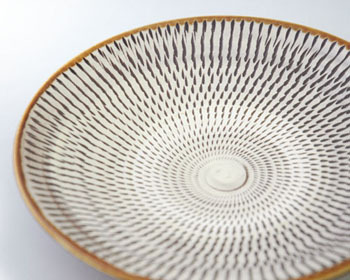 Onta-yaki is an important folk art which still preserves its traditional pottery making techniques. The advocator of the Japanese Arts & Crafts movement, Muneyoshi Yanagai, and an English ceramic artist, Bernard Leach, both highly praised Onta-yaki, and as a result it became famous. The essence of Onta-yaki is “issisouden”, meaning the techniques are passed down from the father to only one of his sons. Thanks to this tradition, it is designated as an Important Intangible Folk Cultural Property of the country. The sound of mortar, which breaks up the potter’s clay, resonates through quiet village among the hills. It is selected as one of the Best 100 Soundscapes of Japan. 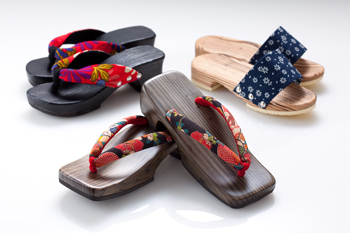 In the Tenpo period (1830-1844), Hita City was under the control of the Edo Shogunate and making wooden clogs was promoted as the town’s new industry by local governors. It has been a representative artifact of Hita since that time and is a traditional craft whose production technique has been passed on to craftsmen who have confidence and display the deep spirit of artisans. In Hita City, the opening of the fishing season of ayu (sweetfish) starts in May, when the green of the surrounding mountains deepens. Ayu in Hita City used to be highly valued; most were over 30 cm, fatty and firm-textured. Kenjiro Kinoshita, who was born in Oita prefecture and was a politician and gastronomist, wrote a book entitled “Bimi-gushin” (lit. Questing for Gastronomy). In this book, he described the ayu from Hita as “Ayu at Mikuma River is the best in Japan.” Also, at Mikuma River, yanaba, a kind of fish trap, is set to catch ayu. 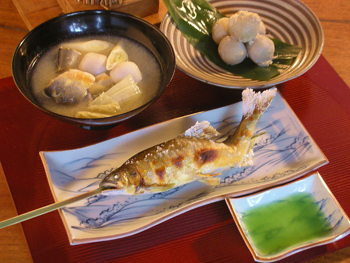 You can enjoy yanaba fishing only in the season when you can eat this delicious ayu. 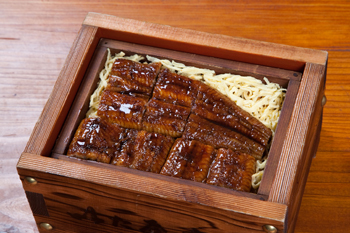 Hita City is famous for its delicious eel dish. Many visitors from both inside and outside Oita Prefecture visit Hita to enjoy this special dish. People can enjoy different kinds of eel dishes such as teriyaki, steamed, and rolled with an omelet. The cultivation of yuzu citrus thrives in Hita City, so people here are familiar with cooking with yuzu. 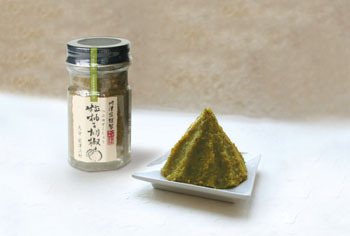 In particular, “yuzu pepper” is a famous Japanese condiment which originated in Hita. October to December is the time to produce Yuzu pepper. It is used not only as a spice but also as a dressing and in various dishes as a hidden flavor. In the Amagase Hot Spring area, there is a fun event called “Yuzu-sanpo” in which visitors can enjoy strolling around the city while enjoying onsen hot spring and dishes using yuzu. Takana Roll is a local “Soul Food” of Hita born around 1965. 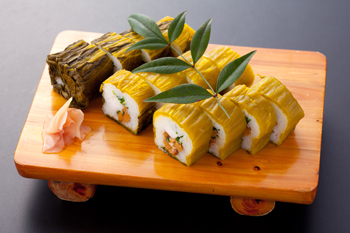 Natto, Japanese yam, green onion, and vinegared rice, are wrapped with a pickled Takana leaf. This is a kind of healthy sushi roll with its own unique history.